OK, I am so sorry it has been forever. I have really been working non stop. I have cooked a little, but it has been my spaghetti with italian sausage and other quick items like that. We have been gone to Baltimore Maryland for a Pet Industry show for our dog clothes business. It was LONG days preparing for the show. Then a day flying there, then a day setting up, then the show was 3 days, then a day to tear down.My favorite part of my time was meeting Nikki, Jay and their 3 fur babies, who are our models. Aren't our babies cute? Can't wait to meet up with Nikki and Jay again. It will happen. Then spent the day in Washington DC to see the white house and all that other stuff. Heavens. I am not kidding. We ended up going there the last 2 nights we were in town because all we could think of was their food. 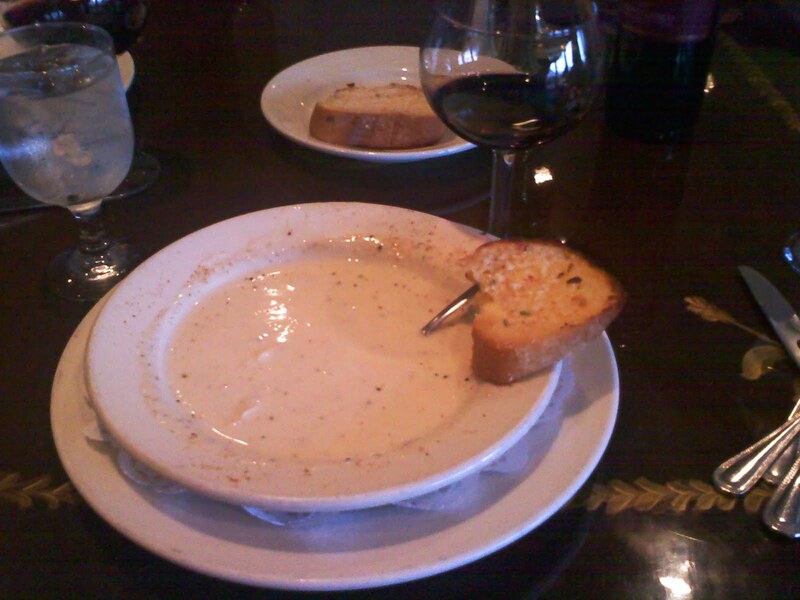 I would LOVE to have their recipe for their cream of Lump crab soup. Spicy and creamy goodness with FRESH crab. Oh my. I cannot say enough. If you are ever in Baltimore it is a MUST. 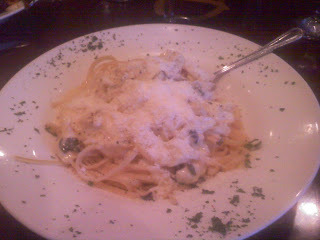 Next I had Granchio Ancona which is: Lump crab meat topped with alfredo sauce Served over linguine. 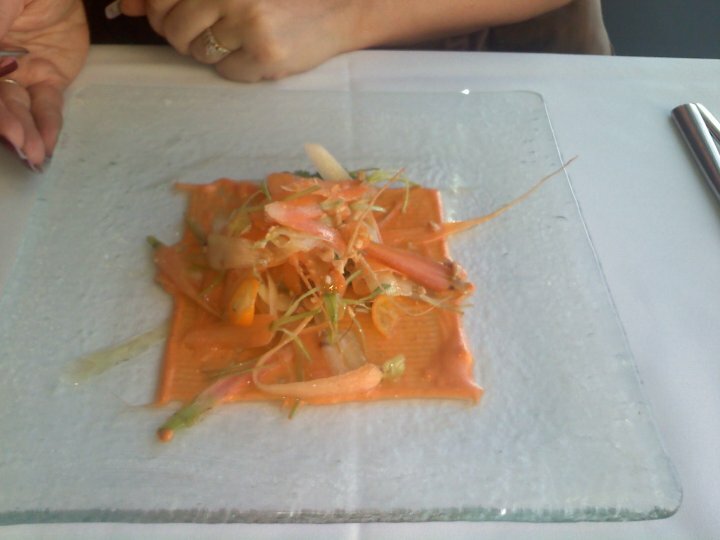 I tried so hard to finish this dish. I was so full. I could not do it. I LOVED and savored every single bite. The fresh made pasta and fresh crab just sent my taste buds into heaven. I had a chianti, I wish I remember the name. 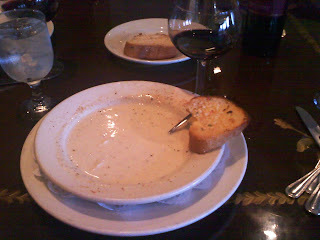 It was a decent wine that paired perfectly with my food and it was only $30. In a nutshell this Dalesios in Baltimore Maryland is a MUST. It is easy on the paycheck and yummy to your tummy. I may just have to do the pet industry show their next year if only to eat there every night. I will be back cooking on Sunday. Meaning I will be back to blogging about my cooking on Sunday. We have another dog show tomorrow and then Sunday is my grocery day so I will meal plan and start posting recipes for all of you again. So I spent more time in Government offices today. Packed up for the pet expo. Did some more designing of marketing materials. Then ordered such materials. Shipped out my orders. Next thing I knew it was 5pm. Not to worry. I pulled my quick and easy meal out of my hat. I had a head of cabbage and 4 packs of freshly made soba noodles (you can find these in the fresh produce isle of your grocery store). I shredded the cabbage, chopped up 1lb of chicken into 1 inch pieces. Put 1 TB oil in a skillet, heated to 375... poured in chicken. Poured in 2 cups YOSHIDA's original sauce. After chicken was halfway cooked, poured in the cabbage and stirred to let wilt. Poured in fresh soba noodles and cooked for about 5 minutes. TADA! Perfect easy delicious SO NOT GOURMET meal. But hey, we all were fed and I can get back to work. Cut them into cutlets and POUND Them to be 1/3 inch thin. Heat skillet to 375 degrees. Then pour in 1 cup canola oil. Heat oil up to 375. Put breaded chicken in skillet. 5 minutes each side. Melt butter then add in flour, salt and pepper to make roux. Add whipping cream and garlic powder. Stir until boiling. Add 2 cups parmesan. Stir constantly until it thickens. Serve over noodles and chicken immediately. I didn't take pictures. But I will add pictures next time I make it. It was all good and there were not leftovers. Next time I will double the noodles. We got our final packet for our Backer show in Baltimore today. "How to avoid sample seekers" I thought it was funny. Who doesn't want the free samples at the show? Ok over and out to the wonderful world of dog clothes. I think I am making a roast tomorrow. With a little over a week to go, I think we are ready for our dog clothes show in Baltimore. 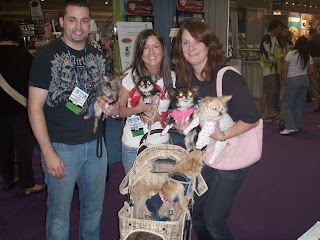 I am super excited to meet up with some of our supermodels from http://www.obsessivechihuahuadisorder.com/ and their Mom and Dad too =) It may sound easy enough, but it isn't. The rules are so strict. Packing everything up and getting it to Baltimore safely has been weighing heavily on my mind for sure. It is interfering with my cooking. Tonight I made taco's for the crew. We had several people in and out amongst my extremely messy house. Filled with dog clothes and suitcases and stuffed dog models. That alone is enough to make me go mad. I do not like clutter. Oh well. This will all be over soon enough. This weekend we will be going to the America's Family Pet Expo Apr 16, 2010 - Apr 18, 2010 and will be getting my daughter's feet wet in our business at Booth 1339. Not that we didn't already have enough on our plate with the Baltimore show... but at least this one is close. Tomorrow night I am making Chicken Parmesan with my homemade fettucine noodles. I am not creating anything new. There will be all the regular stuff going on here until after these shows are over. Which really stinks for those of you wanting a new recipe. If I had time, I would, it would actually help calm my nerves. Who knows. I may surprise you... and myself! I believe everyone has two sides to themselves when it comes to food. For me, the side I would always love to show is me at a 4 course meal, each course paired perfectly with the best wine. Finishing up with a rich dark chocolate dessert that had my coveted Qupe syrah in a perfect glass I can sip down slowly. My other side… A jar of peanut butter while watching Julie to Julia with 1 spoon… to be finished off by my favorite all time ice cream – Ben and Jerry’s Chocolate Fudge Brownie. This side of me only comes around once a month. For you male readers, I apologize. It is a fact of life. Company is gone, my kids come back from vacation tomorrow, my husband is working at the church this weekend. So I have my comforting peanut butter, Chocolate and Chihuahua’s. See, not every single second of my life is gourmet. Besides, I have to fool my metabolism sometimes. I also am not going to mention the brownies that have disappeared. I had help with that one, but to protect the ones I care about the accomplice will remain nameless. So I am at my ultimate comfort level right now. Full of all things bad for me, watching a movie I adore, in a totally empty house (we aren’t counting animals here), while meal planning for the week. I take off for Maryland in 10 days. It is a scary thought. I do not even know if there is any possible way for me to be prepared for this show. Randy keeps saying I think too much. Is that a bad thing? I mean come on!!! I have never presented at an industry show before! This is it, my big company unveiling. I hear horror stories about people running out of catalogs in the first 2 hours. How can I possibly predict how many catalogs I will need? These my friends are the frantic thoughts that led me to a migraine and a pint of Ben and Jerry’s ice cream. Nightmares of not being able to keep up. Or people that aren’t too nice… how will I cope with mania for 3 days in a row? I am thinking of downloading my Julia Child book to my kindle so whenever I panic I can read about food and it will calm me down. For those of you that don’t have a clue what I am talking about, I run a company where we design and sell dog clothes. These dog clothes are in stores. I am going to an industry show in Maryland on April 21st where I will be presenting my designs to hundreds of stores that have never seen my stuff before. It can be a little overwhelming. I am just going to do my best and keep my faith. Now on to meal planning. I do believe a simple night of taco’s is in store for us at some point this week, for Jordan, who continually begs for “normal kid food”. Also, I think I may be cooking for Taylor’s boyfriend sometime this week too. Course he is a boy, and a friend, and they date. SO to me that is a boyfriend. These days the teenagers freak out if you put a label on it, so I will be cooking for a “male friend” of Taylor’s. All of the groceries are being purchased tomorrow, and I am quite sure our grocery bill will be under $100. Lots of great deals out there this week. Go get them! Sunday is the optimum day to purchase. Because a lot of grocery deals run from Thursday- Sunday and then Sunday through Wednesday… Sunday is the best day to purchase because it is the only day you get both deals. Stay tuned for short and sweet posts until this trade show is over, the end of April. The weather has been so nice here. My kids are in Oregon freezing. I miss them. Last week I barely spent $200 on groceries and that is while feeding a house of 8. This week so far I have spent $27. It will easily feed us this week. Did I mention the budget includes wine? Yep, Coupons are where it is at! Continuing on with my shredded chicken to feed the two of us. Well really feed me at dinner and feed Randy dinner and lunch (I am lucky and he always eats the leftovers). I am making chicken enchiladas, well Cheesey Chicken and Black Bean Enchiladas. This is a simple recipe for anyone to follow. 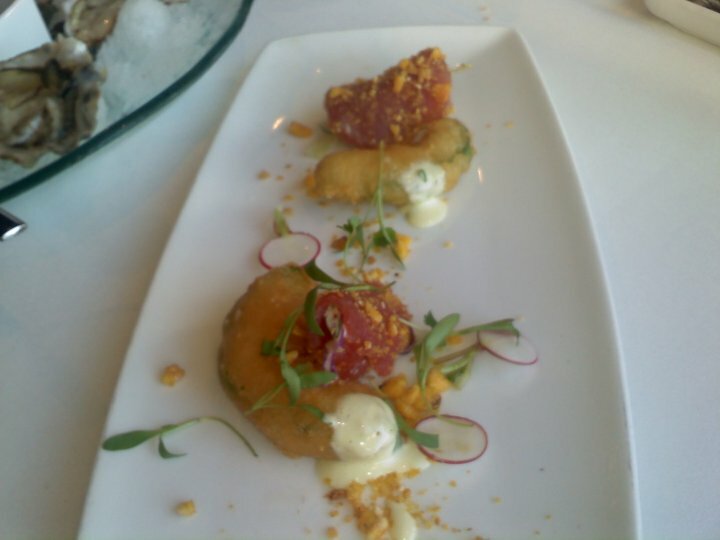 Serve it with a nice salsa salad and creme freche and it is even better. • 1 (4-ounce) can diced green chiles (I use a fresh hot serrano, but most people don't like hot like i do, so a can will do. • Heat oil in a large skillet over medium heat. Add onion and garlic and saute 2 minutes. .
• Stir in black beans, green chiles, and salsa and simmer 5 minutes, until sauce thickens and reduces. Add chicken for 1 - 2 minutes to reheat. If making this recipe without precooked chicken, then add the chicken in step one to cook with the garlic. Remove from heat and stir in cilantro. • Arrange 4 tortillas on a flat surface. Top each tortilla with an equal amount of chicken mixture. Roll up tortillas and place side by side in a shallow baking dish . Top tortillas with shredded cheese (1/3 cup per tortilla). Fast simple and easy. I doubled it because it is super good the next day too. Have fun with it! I am now back to work getting ready for my dog clothes show. Chow! So the kids are out of town for their Spring break. It is just Randy and I at home. So I desperately want to cook, but it doesn’t make much sense to cook when it is just us two. So to ease my pain, I am doing quick easy meals for two. I decided to roast a chicken that I got for $0.66 a pound. With that chicken I will make chicken enchiladas for two. Chicken Pasta for lunches, and a lemon chicken linguine light meal to serve with a white wine when Devon comes over this week. I am helping her launch her new product Gracie’s Miracle. She has developed a spray that heals gums and helps with bad breath for dogs and cats. Since I am in the dog clothes industry, I enjoy letting her pick my brain in regards to marketing and promotion of her product. Any way…. Once again I am going to explain my easy way of roasting a chicken. I really really really suggest using an oven bag . I rinse and dry the chicken and take out all unwanted parts (gizzards, neck, etc..) I rub the bird down with olive oil, sprinkle with salt and pepper and Italian seasoning. Put 1 stick of butter in the birds belly where you would normally put the stuffing. Put the bird in an oven bag along with 1 TB flour and close it with the little plastic clasp they give you. Put it in the oven BREAST SIDE DOWN at 375 degrees for 2 – 2.5 hours. Oh and cut a little slit in the top of the bag… otherwise it will explode. This technique always turns out a perfect bird for me. Moist, tender… shreds easily. Makes the house smell amazing and it is easy. Normally the meat lasts for 2 full meals feeding 6 or more people. It is Randy and I only, so I have to cut it all down and I plan on making 4 meals out of this shredded meat. For the start of this weeks recipes. Cook the bird. Once you take it out of the oven and it is not too hot, shred. This meat can be used for any of my past chicken pasta recipes, along with chicken tacos, nachos, etc..
Stay tuned for the recipes I create with this meat! For the Lemon garlic chicken pasta dinner I am using up the last of my linguine from the box. I can’t stand it, but I have to use it at sometime and since the kids are gone, now would be the time. Boil your noodles according to directions, or if making them homemade, just boil it for about 20 seconds. Set aside. Add the lemon juice, garlic, wine, chicken stock, and capers to the pan with the chicken. Reduce for about 5 minutes, Add 2 cups cooked shredded chicken and cook until warm. Turn off the heat and add the butter, stirring until melted. Toss in pasta. Serve topped with fresh grated parmesan. A small little lemon wedge with fresh parsley sprig makes a great garnish. 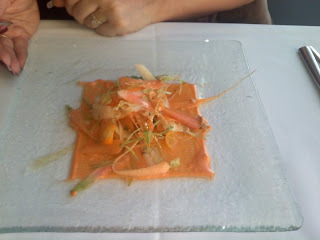 The chef brough my sister and I both a carrot salad on the house. It was so good. I would have never ordered it because it did not sound good, but oh my, I will be hitting him up for the recipe. So light and fresh and wonderful. It was beautiful too! 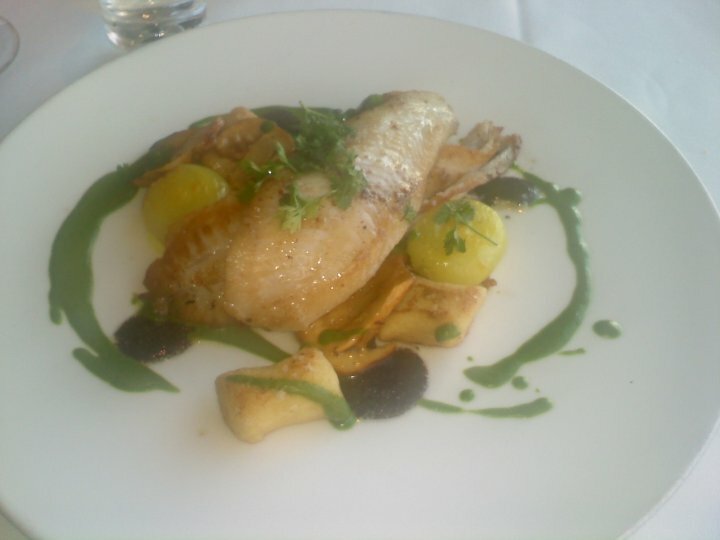 I ordered the Petrale Sole. It had a ricotto gnocchi that was yummy. It was a different texture of gnocchi than I was used to. Almost like it was fried instead of boiled. The plate was garnished with a really good Chervil sauce and truffle vinagerette. There was some blanched spinache as well with some chanterelles. The dinner was scrumptious. 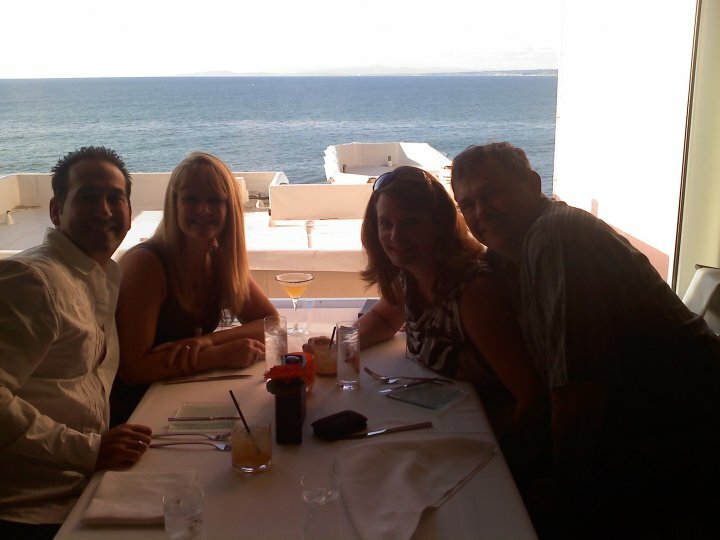 Here is a picture of the 4 of us getting ready to eat. It was a great place and if you are ever in Southern California, near La Jolla, I would highly recommend it. On the left is Fred and Mishelle, on the right is Me with my husband Randy.